Demco Interiors has just completed the second phase refurbishment of the Grade II listed Northampton Central Library, the largest public library in Northamptonshire. The refurbishment of the ground floor fiction library, library shop, children's and cafe area and introduction of self-service was completed in 2009. Now the revamp of the local studies basement and first floor non-fiction areas means that this very busy library, attracting more than 1,000 visitors a day, is bang up to date with a whole range of services and facilities. Innovation arrives at the library with the introduction of an eight seater ‘pod’ on the first floor. 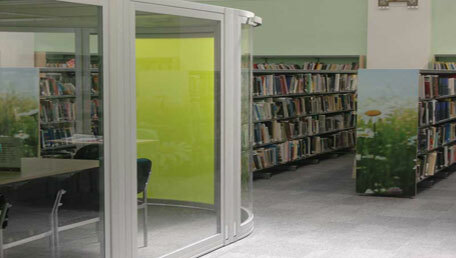 Self-contained, with glass walls and sliding doors, the pod is lime green, to complement the library colour scheme, and is available for library use and as a bookable venue for public hire. Semi-acoustic, temperature controlled and with tables and chairs the pod space can be booked for training, meetings, group study, presentations or private consultations. More information and images on the Demco website.